Balibago is home to hundreds of hotels from the budget rooms of small guest-houses to the five star luxuries designed for the highest standard of living. The recent years have seen an impressive development in hotel services with the likes of the ABC Hotel tearing apart modern standards and taking things to a whole new level. Find below a list of the most popular accommodation available in Balibago. The ABC Hotel has not only achieved fame throughout Balibago and the Philippines Islands. Recognised as a contender for leading hotels around the world, the hotel offers a level of service fit for any holiday you plan in Angeles City. Designed for the gentleman’s fantasy, this hotel boasts amenities unlike any competitor from individual suites to four-bedroom penthouses. Take advantage of the outstanding facilities including the pool-themed club, Aqua Beach Club, and in-room amenities like party Jacuzzis, steam baths, strip-tease bars, champagne chillers, special surround sound, private garden with pool, office rooms, free high quality wireless, and XXL king size beds with futuristic LED lighting! Truly living up to the slogan ‘You Only Live Once’, come and enjoy the combination of luxury, comfort and cheerful, kinetic atmosphere. The Fields Plaza Hotel by ABC offer the highest standard of luxury whilst keeping you in the centre of the action. Boasting the trendiest and most modern suites fully equipped with kitchens, gardens and large balconies with party size Jacuzzi hot tubs and sundecks. Favoured by ex-patriots and tourists alike, these suites have gained recognition not only as the finest hotel to stay with, but as the finest party location in town! Positioned next to the McDonalds, Walking Street, Balibago branch, you are a matter of footsteps from the action but a league of luxury ahead. Wild Orchid Resort is one of the larger hotels in Angeles City. Offering some of the best facilities in town, this hotel/resort is complete with the most beautiful outdoor areas, swim-up bars, and delightful restaurants. A must-stay location for those willing to pay extra for the luxurious visit. Previously the Holiday Inn, The Quest Hotel is the top destination for business functions and staycations. Located in Clark, it is a ten minute drive to the tourist scene however you will enjoy a more modern surrounding and transportation is accessible locally. 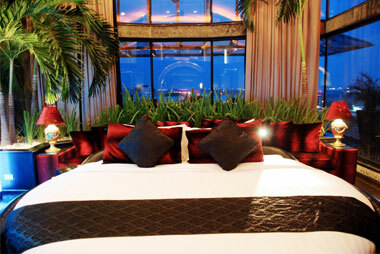 Located in Walking Street itself, Royal Amsterdam offers guests a more luxurious solution without comprimising location. The hotel has spacious rooms furnished with sofas plus free WIFI for all guests. Located just a few steps away from Walking Street, Swiss Chalet offers comfortable accommodation for any tourist without the heavy price tag associated with most similar hotels near the main strip. Featuring one of the best restaurants in town, you certainly won't go hungry when staying at Swiss Chalet. The Clarkton Hotel positioned at the very top of Perimeter Road approaching Friendship highway boasts one of the longest serving establishments in local tourism. Known for its in-house restaurant and large go-go bar, it is a popular hotel among German nationals due to the ownership. Located in the heart of the action, the Dollhouse Hotel is directly opposite one of the largest bars at the Walking Street of Angeles City. Favored for its positioning and various businesses, the Dollhouse Group provide the full works from go-go bars, hotels, restaurants, to leading pool parties! Located along Perimeter Road and just a short walk to the famous Walking Street, this pet-friendly hotel offers everything a visitor could want including access to rooms with facilities including jacuzzis, refrigerators, and microwaves. Ideal for somebody travelling with their pet or looking to cook in their room. Formerly known as the Orange Lion Hotel, The Grand Central Hotel offers twenty spacious rooms at an affordable price. Similar to the Royal Amsterdam, this hotel is situated in the heart of Walking Street, and offers 24-hour concierge and room service.. Located within walking distance of Walking Street itself, Pacific Breeze offers guests everything they could need in Angeles City. All rooms come complete with laptop friendly safe boxes and high speed internet access. The in-house restaurant is popular among many ex-patriots and helped develop a close-knit community. One of the longest serving hotels in Angeles City, the Orchid Inn Hotel is located just a short walk away from the main strip. With some additional bars within view, the hotel boasts involvement in one of the largest operational tourism groups in Angeles City. A short walk away from Walking Street, The Central Park Tower Hotel, offers a little bit of luxury in Angeles City featuring a roof top pool with jacuzzi. Commonly recognised due to the high-rise tower that is visible from the bars at Walking Street, it is one of the upper class hotels in town. Oasis Hotel is often recognised for its outstanding buffet restaurants. Located towards the far end of Permiter Road, the hotel offers a quieter location without compromising accessibility to the Perimeter strip. Boasting a well-lit swimming pool, traditional style pub, and western restaurant, guests feel a little bit of home. The Marlim Hotel offers a more classic setting due to its age and offers a practical solution for those looking to save money on their accomodation. Despite some negatives such as traffic noise and less-modern interior, many have commented positively on customer service. Part of one of Angeles City's larger foreigner groups, the MAC Group operate Kokomo's Hotel and Restaurant in the centre of Walking Street. Boasting one of the strip's only 24/7 bar in its very own premises, Kokomo's is certainly a location every tourist will not miss.. Located along Perimeter Road this hotel offers a comfortable and basic stay in Angeles City. All rooms are air-conditioned with mini-bar and room service, all whilst offering easy access to the Perimeter bar scene--as what is expected from the name. Formerly known as the America Hotel, the improved Hotel America boasts modern facilities, spacious rooms, a large pool, and an even larger 200-seat restaurant. Ideally situated within walking distance of both Walking Street and Perimeter Road and nearby transportation. Montevista offers guests a quiet break with an in house Casino free shuttle service to local attractions and a restaurant. 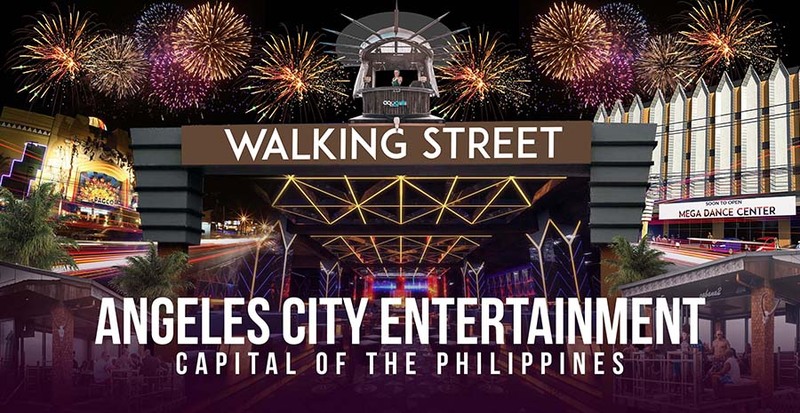 However transportation is necessary to access the Walking Street as this hotel is located inside Clark Special Economic Zone. Located on Perimeter Road, Phoenix hotel offers guests a complete package at affordable rates featuring an in-house restaurant with an international menu, 24 room service, and same day laundry service. Located at the once-famous "Blow Road", it is the only Swedish-owned Scandinavian lodge in Angeles City. Recognized for its bar called HonkyTonk, The Niagara Lodge offers an affordable solution to accommadation near the action. This small hotel offers a comfortable stay in Angeles City featuring a quiet restaurant and bar. Located near Perimeter Road, Marquis Hotel offers parking for those traveling by car. A mystic place with just the perfect blend of American and Filipino interior design, this hotel was famous for its huge lobby area and beautiful surroundings. Located in Villasol, Maharajah Hotel is more suitable for those looking to explore the Perimeter/Friendship areas or those comfortable with transportation to Walking street being necessary. Featuring a casino, swimming pool, restaurant and nightclub Century Resort offers a comfortable base when staying in Angeles City. Located just walking distance from the action on Walking Street, this resort will surely help you enjoy your visit. Located in two hectares of parkland and featuring a large pavilion bar and restaurant, Woodland Park Resort offers both local and international cuisine. With the largest swimming pool in town where guests can relex and unwind, guests should be willing to sacrifice location in terms of the tourist drinking communities. Sister hotel to the nearby Sunset Garden, this hotel is a regular for many long-term tourists, offering affordability for thoes looking to enjoy longer trips. The restaurant, bar, and pool area has been received with great feedback and a lot of attention to their great customer service was drawn. Offering guests a comfortable stay with all air conditioned rooms, this hotel has a swimming pool with diving board, twenty-four hour restaurant, and stocked bar. As a sister hotel to the Premiere Garden, you also have the luxury of enjoying their neighbouring facilities. This small hotel located in Diamond Subdivision is ideal for long-term stay with three daily return bus trips direct to the US Embassy in Manila. Although location involves transportation to the more popular areas, Diamond Subdivision does offer a small drinking, disco, and live music scene. The Marble Inn operates as one of the leading budget hotels with rooms starting at less then one thousand pesos. This is no resort, however the design remains attractive and facilities modern which makes it an ideal visit for someone looking for a standard room that won't break the bank. Located near Perimeter Road, Bluefields Alpha Hotel offers an internal shuttle service for hotel guests and market themselves as a leading small hotel. 24-hour massage service is avaialble upon request. A short walk away from Walking Street, DM Residente Resort offers the perfect place to relax featuring a large swimming pool and garden. Most rooms come equipped with a kitchenette, offering guests the ability to cook within the room and achieve that at-home feeling whilst on holiday. Located in Mountain View but not too far from Walking Street, Hotel Fenson offers a quiet get away with a comfortable room at an affordable price. Complete with a swimming pool deep enough for any man plus an internal go-go bar, it's understandable why this hotel is an Australian favourite. Located just a short walk from Walking Street, L Tinio's offers a budget inn style accomodation with rooms furnished with a small kitchen for guests who want a quiet night in. The hotel is one of the better solutions for tourists looking for a more budgeted stay in the center of the action. Originally operated by famous Angeles City blogger Harry the Horse, La Casa Hotel is a small budget hotel with spacious rooms for tourists and long-term visitors. Complete with a small community of regulars, they are often full and require bookings in advance. 9 Five 0 is a perfect place for tourists on budget and stratigically positioned next door to Margarita Station and in walking distance to Walking Street. All rooms are air-conditioned and the hotel features a roof top bar and restaurant along with all standard facilities expected from a hotel. Affinity Condotel is one of the best options for long-staying guests with its helpful staff and professional service twenty four hours a day. Affinity aims to provide the most comfortable stay in Angeles City with high-class furnishings and modern lifestyle. Located within a five-minute walk to Walking Street, Donald Paul Apartelle offers a modern and affordable solution to your accomodation, complete with all the standard room facilities you would expect. This apartelle comes with an in-house bar and restaurant, outdoor area with a swimming pool, and quick access to the nearby Casino Filipino. One of the larger hotel's operating within the Walking Street, Galaxy Hotel has a restaurant with twenty-four hour room service, an outdoor swimming pool, and gym with rooms furnished with modern facilities. Hilltop Hotel has gained a reputation as the cleanest and most professional short-time hotel in Angeles City. Established in the popular Perimeter Road, the hotel offers short-term stays for tourists visiting both the Walking Street and Permiter Road strips. These rooms are available for long-term stays but very rarely used as such. EuroAsia offers a comfortable stay for any guest with its good-sized rooms, 24-hour room service, well-staffed restaurant and two bars, and a relaxingoutdoor swimming pool. Formerly known as EuroPhil, this hotel was recently refurbished with modern facilities. As one of the Philippines' budget hotel chain, guests are guaranteed to find comfort and relaxation at Sogo. Though perfect for someone on a budget, the hotel is located in Dau, which would require transportation to access any of the tourist areas including, Walking Street and Perimeter Road. Sitting in the heart of the Clark Freeport Zone, this hotel offers large rooms and a quiet place to stay and relax. With three on-site restuarants and bars plus outdoor swimming pool and gardens, guests will certainly enjoy their stay without leaving Clark. Located inside the Clark Freeport Zone, Widus Hotel offers guests the perfect getaway with an on-site casino, swimming pool with waterfalls, spa, gym, bar, and restaurant with 24-hour room service. Unfortunately, guests will require transportation to reach the major tourist areas. As one of the most reputable condominium chain in Angeles City, Kandi Suites is the number one condo option for both short-term and long-term stay. With locations spread around Perimeter Road and Walking Street, this is the ideal place to stay with options raging from studio-type and two-story apartments with daily maid service and swimming pools. Offering some of the finest hotel accomodation in Angeles City, the Lewis Grand Hotel is located along Permieter Road and gained recognition as one of the leading names in town with its modern facilities complete with one of the finest swimming pools and outdoor areas. A hotel that is meant to feel like home without spending a fortune, this is perfect for long-stay guests. Featuring large rooms with computers and just ten minutes away from Walking Street, Medgar Executive Apartelle is a leading name in budget hotels. The PJ Ramada offers modern facilities alongside a restaurant, pool area, and on-site massage facilities. A fantastic location for someone looking to take advantage of great value for money, it's a hotel with 48 rooms that offers high quality service at an affordable price for a pleasant and enjoyable stay. Rumi Apartelle Hotel is located along Perimeter Road and offers both short-time and overnight accomodation. Complete with basic facilities and a shuttle service to Walking Street, guests can enjoy a comfortable stay and take advantage of the twenty-four hour room and massage services. Believing in a well-rested traveller, Savannah Resort offers comfortable rooms, a twenty-four hour café, and a swimming pool whilst only a short drive to Walking Street. Savannah boast more then sixty rooms with various higher room categories available during your stay. Recognised as the latest and greatest, the modern Score Birds Hotel offers a pleasant stay in Angeles City with air conditioned rooms and an on-site restaurant. Guests can never go wrong with the hotel's regular pool parties complete with bikini competitions. Catering to the long-staying visitor, Sydney Hotel is located on Perimeter Road and offers a selection of first-class services including high speed internet access, laundry service, and twenty-four hour room service. The hotel is designed as an affordable solution to guests' accomodation, whilst maintaining luxury and comfort. The Brass Knob Hotel, located along Perimeter Road and just a few-minute walk away from Walking Street, features a nightclub and restaurant with a daily shuttle bus to Subic Bay. Complete with a large foreigner community, guests will certainly make some friends during their stay. A budget hotel with just seven rooms, The Limited Edition is designed to offer cheap accomodation to tourists and ex-patriots. Complete with a small restaurant and WiFi services, guests can expect the basic necessities of a hotel without the heavy prices. Just a few minutes walk from the Walking Street, Tiger Hotel offers everything guests would expect from a hotel that puts customer service first. Rooms include a small kitchen area with microwave and free high speed internet access making it the perfect accomodation for long-staying guests. Vera Hotel offers its guests a comfortable stay with a concierge service, room service, and airport shuttles. The on-site restaurant is perfect for guests that want to stay close. This hotel is located in Villasol Subdivision near Friendship and transportation is necessary in order to access The Walking Street. Walkabout Hotel is the leading Australian hotel on Walking Street, offering guests the perfect stay for those wanting to be in the heart of the nightlife. Complete with an indoor swimming pool, restaurant, and airport pickup, guests can't go wrong with their affordable rooms.